Viral hit Conan Exiles has received a new update, adding a bunch of new features and some exploit fixes. The multiplayer game, which is still in early access, now contains a "decay" system for buildings: old buildings will be "cleaned up" over time. This feature is disabled by default on private servers and enabled by default on public ones, according to the patch notes. The next new feature is a dyeing system, which allows you to brew new colors to dye your armor with. Just gather pigments and go to the Firebowl Cauldron to brighten up your garb. Eight new weapons are included in the update, which also fixes a bunch of bugs and unintentional exploits. Check out the full patch notes below, or take a look at the dye system in action here. Additionally, developer Funcom announced a new rewards system for players who report back on any exploits. The scheme, called Exploit Hunters, isn't included in this update, but more information will be revealed next week. Conan Exiles became an online sensation earlier in the year, in no small part thanks to its genital physics and endowment slider. For more on that, check out our NSFW "mighty dongs" video here. 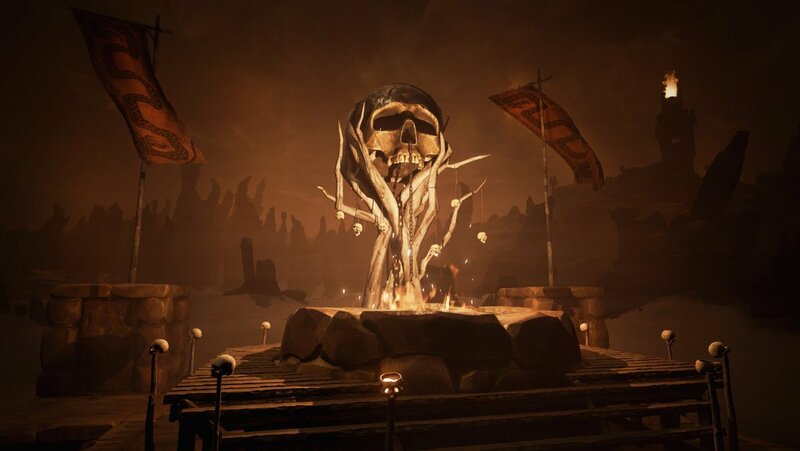 In other Conan Exiles news, Funcom recently detailed its plans for the multiplayer game's future content updates. $5-10 million will be invested over the course of this year, with the full game coming to PlayStation 4, Xbox One, and PC in the first quarter of 2018 after an early access version launches on Xbox One in Q3 of this year. There are no plans to bring the title to Nintendo Switch, however.